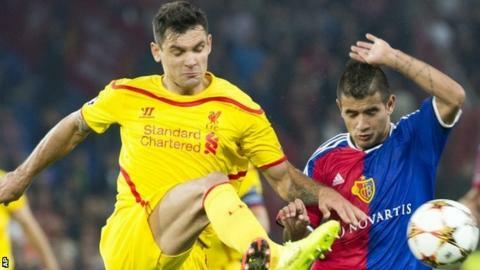 Liverpool defender Dejan Lovren will miss Croatia's Euro 2016 qualifier with Bulgaria on Friday after sustaining an abdominal injury. The centre-back, 25, picked up the injury while training and will return to his club for further assessment. Brendan Rogers' side have already lost Daniel Sturridge, Joe Allen and Emre Can to injuries picked up on international duty this season. Liverpool have just two fit centre-backs in Kolo Toure and Martin Skrtel. The Reds next game is in the Premier League at QPR on 19 October and three days later they host Real Madrid in the Champions League.